To drink milk or not to drink milk? Advocates on either side of the milk debate are adamant in their arguments. Funnily enough, Ayurveda agrees with both sides. According to the ancient Ayurveda text book, the Charika Samhita, the misuse of milk turns the nature of milk from sattvic to tamasic. Sattva is a state of lightness, balance and clarity, and, in terms of food, strengthening and nourishing. Tamas, on the other hand, reflects dullness and confusion. By compromising the essential qualities of milk we can turn a health-supporting food into one that can lead to ill health, congestion and allergies. Ayurveda experts recommend cows milk, taken in the correct manner, as a satvic and nourishing food. Accordingly, milk provides special and unique nutrition that cannot be derived from any other type of food. When digested properly, milk is able to nourish all the tissues within 24 hours. It also helps to balance the doshas, especially Vata and Pitta. It is also one of the most important foods to promote ojas. Ojas is said to be the refined substance that the body produces at the most subtle level of proper digestion. Ojas brings strength, strong immunity and contentment to the whole mind/body system. Ayurveda experts point out that many of the problems associated with digesting milk are in fact linked to the way in which milk is consumed and how it is processed. Cold milk, ice cream and cheese are indeed very heavy and difficult to digest. Following a few simple guidelines will help address many of the problems associated with drinking milk. If you boil milk before drinking it (even if the milk has already been pasteurized) the milk will not only be lighter and easier to digest but it will also create less congestion. Boiling milk is a must, even if you do not have difficulty digesting milk. In addition, you can add heating spices (such as ginger, turmeric, clove, cinnamon and cardamom) to milk before boiling it. These spices help to enhance our digestive fires and also help reduce Kapha dosha, lessening the tendency toward congestion. An added benefit is that the milk will act as a carrier for the spices, thus allowing the physiology to gain more benefits from the health-promoting herbs. Milk should never be mixed or eaten with sour, bitter, salty, astringent, or pungent tastes. This means the traditional American lunch consisting of a glass of cold milk with a sandwich should be avoided. Milk should either be taken separately from meals by at least one half hour or taken only with other sweet tastes (such as breakfast cereal, toast, rice, dates, mangos and almonds.) Be careful not to add sour fruits to your breakfast cereal or to drink fruit juices with your cereal. When combined with incompatible tastes, milk becomes indigestible and causes the build-up of harmful toxins in the body. Dishes made from cooking milk with fish or meat should also be avoided (such as clam chowder). Milk (or yogurt or cottage cheese) combined with bananas can be extremely difficult to digest and can lead to congestion and head colds. Ideally any milk that we drink should be organic, whole and non-homogenized. Non-homogenized because homogenized milk is very difficult to digest and can easily clog the finer channels of circulation. Whole milk because the fats in whole milk build and balance the nervous system and act as carriers to deliver the calcium and fat soluble Vitamins A, D3, E and K directly into the cells. If you are not able to purchase organic milk, however, it is better to drink skim milk, as many hormones and chemicals are fat-soluble and will be transferred into your physiology via the fat. Even if you do not notice ill effects of drinking milk, if you have a long habit of drinking cold milk or drinking milk along with foods of other tastes, it is probable that you have a build-up of ama, or toxins, in your tissues. This can lead to joint pain, constipation, dullness, lowered immunity, frequent colds and imbalances that can lead to chronic disorders. 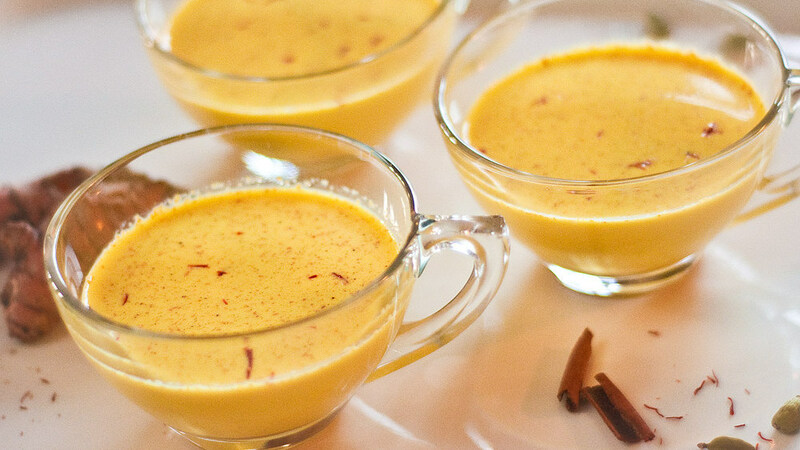 ( Picture of turmeric/cinnamon milk. Source: Google Advance Image Search. This entry was posted in Ama, Ayurveda Treatments, diet tips and tagged Ayurveda detox, Ayurveda Diet tips, Ayurveda milk, milk, Panchakarma by The Raj blog. Bookmark the permalink.